How our team took 4,520 photos over four nights for the relaunched website. 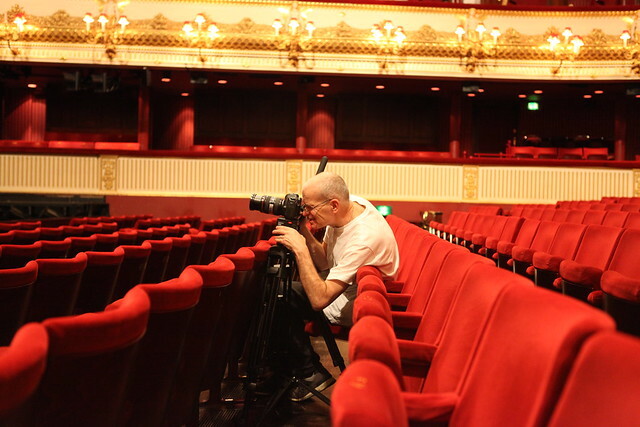 Earlier this year myself and three others decamped to the Royal Opera House auditorium for a unique photo shoot. Unlike most of our photography sessions, this was not about capturing a perfect pirouette or dramatic moment courtesy of our artists. For this shoot, the stage and the auditorium itself were to be the stars of the show. Our task was to photograph the view of the stage from each of the 2,260 seats in the auditorium for the website – which as you may have noticed, has recently had an extensive makeover. A major part of this design is the completely updated booking system, which now allows those purchasing tickets to see the view from - and of - the seat prior to booking. This meant that a total of 4,520 photos had to be taken. All this had to be done throughout the night as this is the only time auditorium is empty: the rest of the time being busy with performances, rehearsals, tours and technical business. The task required a lot of stamina - and seemingly endless coffee - with the group working a total of four long and exhausting nights. Each evening we started immediately after the performance concluded and packed up to go home at 10am the following morning. You might think this task would be tedious due to the repetitive nature of capturing the images, but strangely enough this was never an issue. In fact, I felt hypnotized by the process, and my actions became automatic and almost unconscious. Perhaps some of this was down to sleep deprivation. This is amazing! Is this a first? Congratulations to the team for their patience and making what seems a tedius task fun. I am sure the audience would find the seat views very helpful. While I can appreciate the desire to give more information about individual seats the picture of the photographer above shows a flaw in the execution. In real life there would be people sitting in the seats in front and the camera would be showing a picture of the back of their heads! Thus the view of the stage would be very different from that on the selection screen as the rake in the stalls is so shallow. Photographing the view from every seat in an empty auditorium seems a bit of a gimmick when the seat information given fails to mention other factors such as the limited legroom and narrow seat width in the amphitheatre. The photographer above would have been photographing the views from the seats in the row in front of him. This was in order to get the camera as close to where someone’s eye line would be, taking in to consideration the camera and lens used. A lot of planning and thought went into taking the photographs in a way to give a close to real representation of the view and we have added notes for the seats with limited legroom or restricted views. Thanks for your response, however I don't think you can get away from the fact that in the stalls one's view of the stage is severely affected by the presence of people in front and the photos may mislead people. Many opera goers I talk to recognize this and try to sit elsewhere. (This can be a problem in other the London theatres not just ROH). As far as acknowledging lack of legroom; the front row of the Amphitheatre does have less space for people of normal build than the other rows but it is not mentioned, only those seats with even less space are indicated. I have always assumed that the lack of knee room is the reason for the slightly lower price for the front row so have been puzzled by the omission of a warning about this. I also suppose that it might not be popular to suggest that amphitheatre seats are not suitable for those of ample girth! Having made these adverse comment I do feel that the photos from seats with what one might call a "structural restriction" to the view are useful in helping to decide whether one could cope with it. That was fascinating. The resulting web page is very impressive and a great example of how the web can enhance even simple tasks like booking a ticket. I'll be using this feature regularly in the future I'm sure. It would be great if there were somewhere on the website that one could access the seating plan/photographs so that one could have a better idea of where one would like to book in advance of booking days. If the seating plan is generally available on the website, I have been unable to find it and that's a shortcoming. Thanks for your comment. We're afraid there isn't yet a seating plan on the site but we will be adding this very soon, along with a host of other content and functionality. promised there would 'very soon' be seating plan photographs on the website. I would like to look at seating views well in advance of booking and even after booking but the feature only seems to work when the seat has not been booked. Am I missing something? You can see the view from any seat that's open to book and unsold by navigating to the production page, selecting a performance and choosing a seat. We are planning to offer an option to view the seat for any seat in the auditorium as another option (ie. Users won't have to search through dates for one where their preferred seat is available), but this functionality is not yet live. Very nice, but it doesn't show that seats in row A of Orchestra Stalls do not allow me to see dancers feet , something important for the enjoyment of ballet. Before the massive renovation some years ago this was my favourite seat, but I suspect that the rake of the auditorium was improved at that time and the front row made a little lower. So pretty as the photos are, they do not, and cannot, take into account something like my front row problem. Useful, but nothing is as good as personal experience! Brilliant. More than worth the effort. I wish I had spotted this before I bought three separate nights for The Mariinsky Ballet Swan Lake in the Grand Tier in the middle of rows C & B. But any anticipation about the tickets bought now nicely put to bed. All theaters should do this.